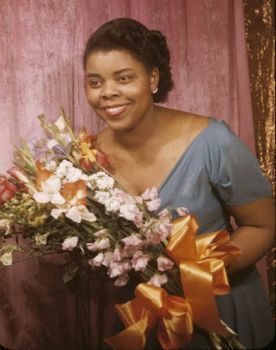 Contralto singer Carol Brice was born in Sedalia, North Carolina on April 16, 1918 into a musical family. Eventually she became one of the first African American classical singers with an extensive recording repertoire. Brice trained at Palmer Memorial Institute in Sedalia and then enrolled in Talladega College in Alabama, where she received her Bachelor of Music degree in 1939. She later attended Julliard School of Music between 1939 and 1943 where she trained with Francis Rogers. In 1943 Brice became the first African American musician to win the prestigious Walter W. Naumburg Foundation Award. Carol Brice first attracted public acclaim at the New York World’s Fair in 1939 when she performed in the opera, “The Hot Mikado.” Her next major public performance came in 1941, when she sang at a Washington concert honoring the third inauguration of President Franklin Delano Roosevelt. Her brother, the pianist Jonathan Brice, was frequently her accompanist at concerts and competitions. Ms. Brice’s Broadway career accelerated after World War II when her talent for both opera and musical theatre became apparent. In 1946 she received her first recording contract from Columbia Records for Manuel de Falla’s El Amor Brujo, which was performed with the Pittsburgh Symphony Orchestra conducted by Fritz Reiner. She sang with the Pittsburgh Symphony for all of 1946 and later performed as Addie in the New York City Opera’s 1958 production of Marc Blitzstein’s Regina. Brice remained with the New York City Opera until 1963. She performed with Volksoper in Vienna, Austria from 1967 to 1971 and the Houston Grand Opera from 1976 to 1977. She played Maria in the Houston Grand Opera production of Porgy and Bess. The recording of that performance won a Grammy and the entire show moved to Broadway where it won a 1977 Tony Award for Most Innovative Production of a Musical Revival. Brice also had a successful career on Broadway. She played Kakou in the original Broadway cast of Harold Arlen’s Saratoga (1958) and Maude in the 1960 revival of Finian’s Rainbow. During the 1960s her numerous roles included Catherine Creek in The Grass Harp, Harriett Tubman in Gentlemen, Be Seated, and Queenie in Showboat. While performing in Vienna in 1968, she met her husband, the baritone Thomas Carey. The couple had two children. Mr. Carey returned to the U.S. in 1969 to teach at the University of Oklahoma in Norman, and Carol Brice joined him there after another stint on Broadway. Ms. Brice officially joined the University of Oklahoma faculty in 1974. One year later she and her husband founded the Church Circuit Opera Company in Norman, Oklahoma. The company was renamed the Cimarron Circuit Opera in 1981 and continued until Thomas Carey’s death in 2002. Carol Brice died on February 14, 1985 in Norman, Oklahoma. She was 66. Masterworks Broadway, http://www.masterworksbroadway.com/artist/carol-brice; Bach Cantatas Website, http://www.bach-cantatas.com/Bio/Brice-Carol.htm; John Gray, Blacks in Classical Music: A Bibliographical Guide to Composers, Performers, and Ensembles (New York: Greenwood Press, 1988).